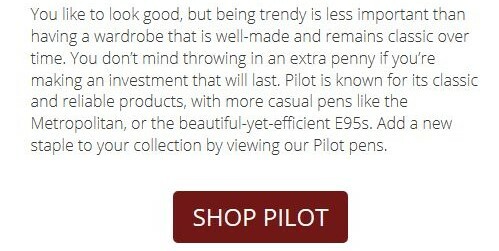 I took the Pen Brands to Match Your Style Quiz at the Goulet Pens blog. I expected Pelikan to be the result but they gave me Pilot. I actually own more Pilots than Pelikans so fair enough. I even almost bought an E95s once. For about 60 seconds of amusement visit the Goulet blog to take the quiz. I wonder what brand they'll match you with. Do share. I matched up with a Pilot, too, classic and reliable. I own one fountain pen -- a Pilot! Interesting, I fully expected a classic, traditional brand but it matched me to Karas Kustoms, who I'd never heard of. All aluminum and durable because of my 'outdoorsy' lifestyle. Makes sense, I have a couple of all aluminum pens that are my go-to pens for just that reason!